This was the traumatising experience of Marlian, a mother-of-three, following the recent 7.5 earthquake. “I ran outside pulling my children by the hands and then I saw my house just ‘fly away’. “We lost everything. Our house is gone, our gardens are gone and the water has turned red so we cannot drink it or wash in it. “We are sleeping in the bush without any cover. Marlian shared her story during one of the many visits by Oil Search Limited (OSL) to her Southern Highlands home at Kekero village. Marlian was one of the villagers to receive clean water, food and shelter provisions provided by donors and delivered by Oil Search helicopters. 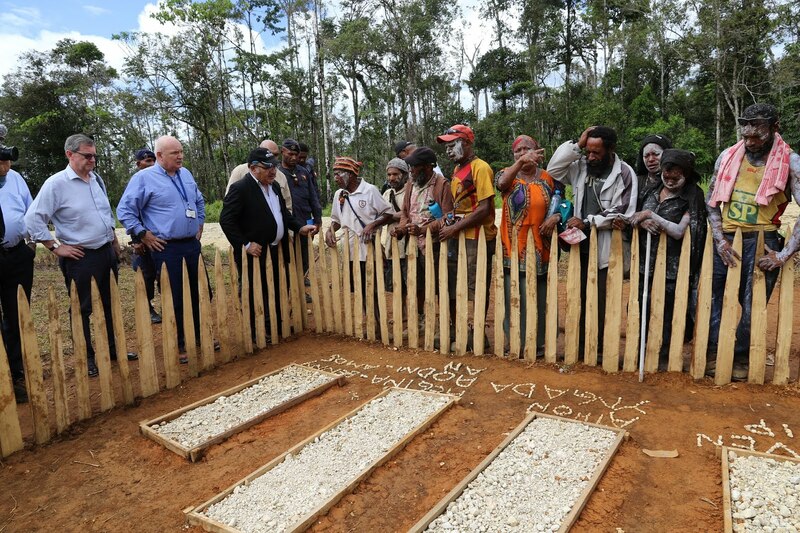 Prime Minister Peter O’Neill recently visited earthquake affected areas in Southern Highlands and Hela provinces alongside Oil Search Managing Director, Peter Botten, and the Australian High Commissioner, Bruce Davis. Also in the delegation was Kumul Petroleum Managing Director Wapu Sonk, State of Emergency Controller Dr William Hamblin, MRDC Managing director Augustine Mano and senior government officials. The Prime Minister witnessed the earthquake relief coordination centre at Oil Search’s Moro Camp that is receiving emergency supplies from Australian and New Zealand military aircraft for onward distribution to affected communities. These supplies have been provided by a range of donors including Australia, New Zealand, Oil Search, Trukai Rice, Population Services International, UNICEF and UNFPA. Supplies purchased by the PNG Government are also being distributed from both Moro and the PNG Defence Force base in Mt Hagen. 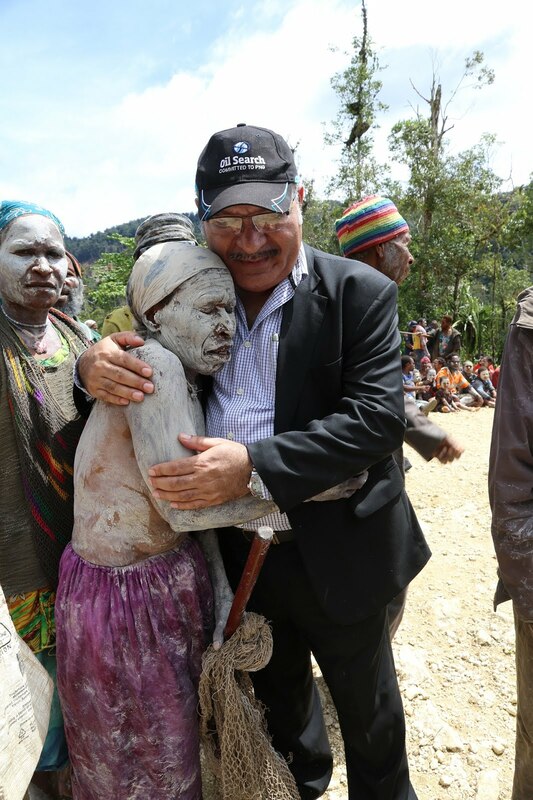 “It’s very sad to see a lot of destruction and lot of displacement of our people, it’s certainly a lot of stress communities that have been affected by earthquake,’’ Prime Minister Peter O’Neill said at Kekero village. “Slowly the relief supplies are getting in, the injured are being taken to hospital, progress is still being made and we are pleased with the progress so far. “I want to express our gratitude to the private sector, especially Oil Search, the Australian government, the New Zealand government, the Israeli government, the Chinese government, and others who have rallied behind Papua New Guinea to bring relief supplies to the communities. It’s working very well and team work is very important. The Prime Minister noted that given the extent of the crisis and the need to coordinate efforts, it would have been extremely difficult for any one partner to do it alone. The delegation travelled to Kekero village to see a community that was severely affected by the recent 7.5 earthquake while a village next to Kekero was completely wiped out by a landslide, and the survivors now living in makeshift care centres. Following visits to earthquake affected areas, the Prime Minister stopped into Tari, Hela Province, to see firsthand the work of the Provincial Disaster Committee and the Hela Provincial Health Authority (HPHA). A provincial government-led disaster effort alongside a dedicated health response by the HPHA has been underway since the earthquake. Despite being hampered by bad weather and road blockages that have placed limits on the supply of fuel, partners have been able to reach more than 10,000 villagers since relief efforts started and will continue to deliver supplies to meet the most immediate basic needs. Coordinated efforts have also meant that much needed medical supplies are now arriving at rural health facilities.